Pebble app to facilitate quick control of a Philips Hue light bulb. 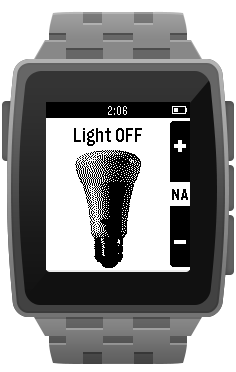 It will toggle the preselected light ON or OFF as soon as the app loads, so it is designed to be registered as a button shortcut (Quick Launch Pebble feature) for quick light control. The Up and down buttons within the app will also change the brightness of the light. The latest, not for production, app version from the GitHub repository can be installed by clicking this link on your phone. The Pebble phone app should be able to catch the .pbw file and install it in your Pebble smarthwatch. 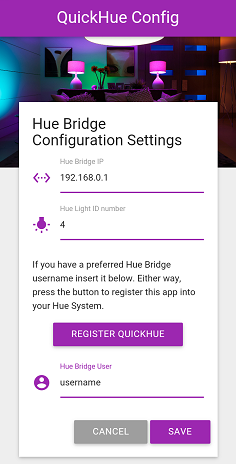 A future update to the app will allow automatic pairing with the bridge, but at the moment to use the application with your Philips Hue bridge you will need to provide a developer user ID in the settings page. More information about creating a user can be found in the HUE API - Getting Started page. "Hue Personal Wireless Lighting" is a trademark owned by Koninklijke Philips N.V., see www.meethue.com for more information. This project and its developer/s are in no way affiliated with Koninklijke Philips N.V. Content licensed under a Creative Commons Attribution 4.0 International License, except where indicated otherwise. Attribution for all other resources used can be found here.